Number of coins: 22,000,000 (one indivisible unit is on the same level as bitcoin 1 satoshi, 1 coin - 100,000,000 Satoshi). Dash was originally created as XCoin (XCO) on January 18, 2014. On February 28, 2014 the name was changed to "Darkcoin". On march 25, 2015 Darkcoin was introduced as "Dash"
I discovered Bitcoin in the middle of 2010 and since then it has taken my mind. 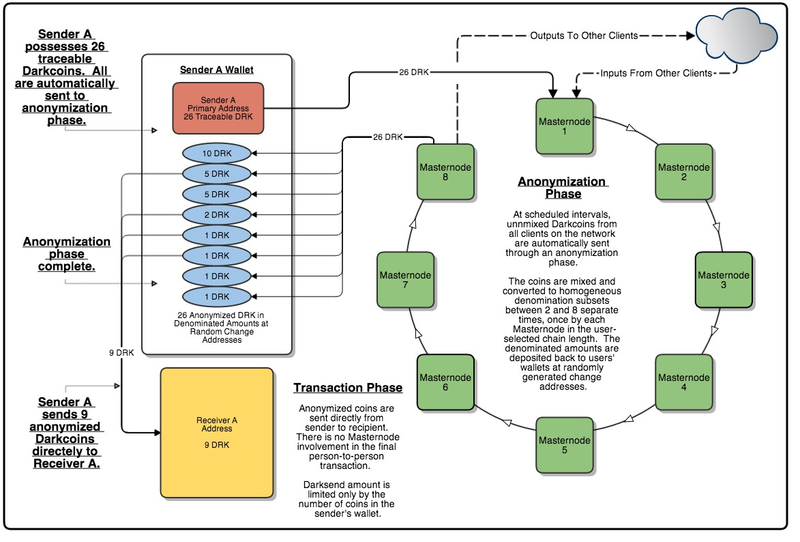 In a couple of years, in 2012 I began thinking about how to add anonymity to Bitcoin. I found about 10 ways to do this, but after the release, my code wasn’t included in Bitcoin. The developers wanted the basic protocol to remain largely unchanged, and this also applies to everything else that is based on it. This was the birth of the Darkcoin concept. I implemented the X11 algorithm over the weekend and found that it works surprisingly well and solves the problem of fair distribution of the award, and it can become a good basis for launching the crypto-currency. I actually used a similar growth curve in X11, in which the miners must fight to create even a slight advantage, just as it was in the early stages of Bitcoin development. I think this is necessary to create a living ecosystem. The launch of this crypto-currency was accompanied by a scandal. In the first hour of the launch, about 500,000 Dash were mined. The next 1,000,000 Dash were mined in 7 hours and, finally, another 400,000 in the next 36 hours. The above 1.9 million Dash were produced in 48 hours, or about 32% of the current volume (5.9 million in October 2015), which generated a discussion about the initial distribution. In June 2014, the industry news website Cryptocoinnews wrote "One of the biggest pits on the way of Darkcoin is connected with big instmining." According to the developer, the reason of this was a bug in the code, "which incorrectly transformed the complexity, the incorrect meaning of which was then used to calculate the reward, which led to instmining"
Dash has an excellent infrastructure, active users, own forums, support of the X11 algorithm by different mining pools, hardware solutions for mining. A strong impetus for Dash was that it allows any user to vote and decide where the project will go further and also its feature to finance itself. Dash is a first-generation crypto-currency (I recall that the first generation of crypto-currencies is a modernized bitcoin code, XMR and IOTA are second-generation crypto-currencies). There was a time when it was possible to make a popular crypto-currency and many fans by changing the bitcoin code. This is exactly what happened with the Dash. Its creator literally got bitcoin, in the distant 2010, tried to make it more anonymous, but the bitcoin core developers did not accept his changes, did not want to change the core of the system. Therefore, one day - he decided to make a fork and modify bitcoin. According to his words, literally over the weekend, he implemented a new algorithm for the system. And now more about each item. The total number of coins in bitcoin was 21 million, in Dash - this amount is increased by 1 million. It is unclear for what purpose. But considering the fuckup at the very beginning, when 1.9 million Dash were pre-mined in the first 24 hours due to an error in the code - we can assume that this was done deliberately, although Evan Duffield wrote that this is not true. In any case, this has been beneficial, as Dash makes us more happy for more than three years. But in Dash, the miner does not receive the entire award for the block, but only 45%, the remaining 45% are received by the owners of the masternode, and the remaining 10% are used to finance the crypto-currency projects, based on the results of voting in the governance module. We’ll talk more about that later. blue curve - the complexity of mining. Now the reward is about 6 DASH per block. The block is generated approximately every 2.5 minutes, the total number of coins is limited by 22 million, the reward for the block is 5 Dash, and the volume of the generated crypto currency will decrease by 7% every year until it approaches zero at 2150. Keccak was already described earlier in the cryptonight algorithm, which seemed to me the ideal algorithm for consensus and was ideally suited to what Satoshi "preached" in his white paper. The essence of using 11 algorithms is that if Sha256 is hacked, then bitcoin will be in serious danger. Dash does not suffer in this case, because it is necessary to crack 11 algorithms at once, which is quite difficult. In addition to hacking, there is still the problem of asics, which prevent the network from decentralized developing. Evan Duffield wrote that he did not set the main goal in protection from ASIC, and in the future, perhaps, they will appear, but the creation of ASIC for this chain algorithm will be accompanied by difficulties. Also - X11 is more balanced for GPU and CPU mining. When there were no FPGA devices designed specifically for mining (ASIC) - once users made a mining client for the GPU, the CPU was a thing of the past, because the graphics adapters gave a multiple increase in the speed of mining. In X11, this problem is not so noticeable, because the CPU and GPU speeds are not so different. Accordingly, mining is accessible for everyone and centralization was not foreseen. But there are miners on the X11 algorithm, which should alert us, but no, since the miners are only half of the Dash network. We’ll talk about this below. In addition, there are opinions that X11 mining is accompanied by a lower load of video cards, and so, respectively, there is less heat and less cooling necessity. Anonymity in Dash is no longer the most relevant and interesting moment, because, as we have already explained, anonymity in Monero is laid down at the protocol level and bypasses such anonymous currencies as Zcash and Dash, in which anonymity is an add-on over a common protocol. But Dash has several interesting moments related to anonymity. Anonymity in the Dash network is built on a technology called privateSend, and on special nodes, masternoad. The amount of sending is divided into orders (denominated). 0.01 Dash, 0.1 DASH, 1 DASH and 10 DASH and are sorted like the usual money that you use every day (in a whitepaper this process is called a denomination). Your wallet sends an "anonymous request" to the masternode, allowing it to know that you need to mix the coins. When two other (or more) network members send similar messages that they want to mix similar denominations, the mixing session begins. 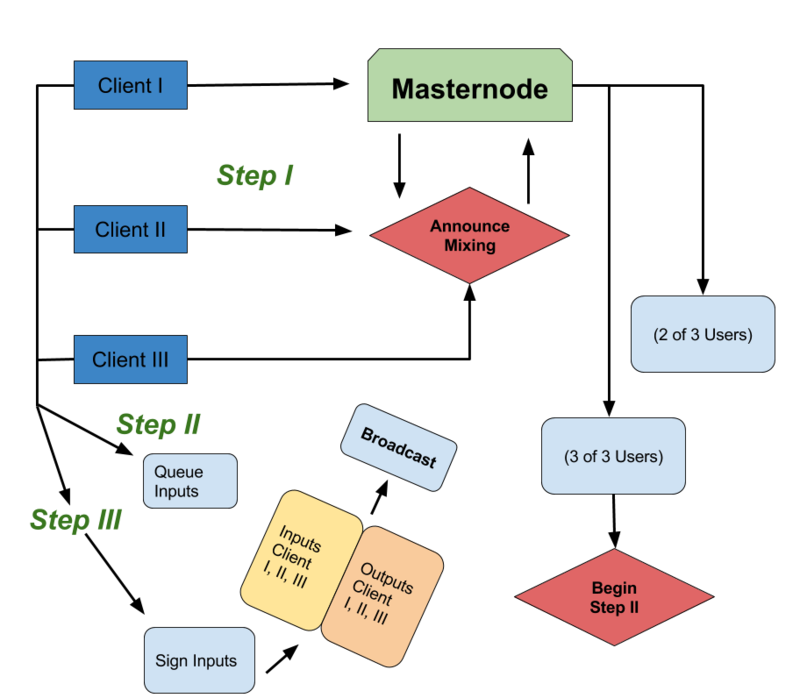 Masternode mixes all transaction inputs in a random order, and notifies all session participants of what transactions they need to send themselves, but on the change address. In order to completely hide your funds - each wallet repeats the sending process for each denomination. Each such sending is called a round. The more rounds - the more difficult it is to determine where and where funds were sent from. This process occurs in the background, and does not require your intervention. When you need to send coins - your transactions are already hidden and you can safely send these funds. The owner of the masternode - receives commissions directly from the blockchain for keeping this masternode, allowing users to hide coins. But how to get rid of the possible fraud, on the part of the masternode owner? Pledge! In order to create a masternode, a deposit of 1000 DASH is required. This money can be returned when the masternode is dissolved. The main, but not a one "feature" of Dash – is the presence of master. Unlike bitcoin, in which all nodes are equal - there are also masternodes in Dash that form their network in the Dash network and their own consensus. Masternode play a key role in algorithms such as privateSend and InstantSend, and also will allow developers to add more technologies. Each participant of the network can create his own masternode, you only need to buy 1000 Dash on the exchange and freeze them in your wallet, after that you will start receiving income from this masternode. The income per year is around 10% of 1000 Dash. Sounds good, considering that 1 Dash at the time of writing the article - $ 770. For example - the instantSend technology, which allows you to make transactions instantly (which is very cool, since Dash positions itself exactly as a payment system). The essence of this technology is that when a user wants (for an additional fee) to send a transaction instantly - he only needs to send it to the trusted node - masternode. When the transaction was verified and confirmed by the level of the masternode - coins can be used for the intended purpose and the transfer is considered to be completed. Masternodes in this case themselves are responsible for the further addition of the transaction to the block. Decentralized Governance by Blockchain. This mythical phrase is also the main cool feature of the Dash crypto-currency. It looks like this: any member of the network can start a voting on development of the system. Will it be legal, marketing or technical, improvement of design or hiring of the personnel, creation of conference and so on. The cost of the voting start is 5 Dash, which are subsequently destroyed. After that, the vote is recorded in the blockchain and stays there. Only owners of masternodes have a right to vote, i.e. those network members who have 1000 DASH in their pledge. Possible voices - "Yes", "No" and "Abstained". Initiatives should gain at least 10% more "yes" than "no", and also compete with other submitted proposals for the main prize (10% of the award for the block), approximately 8,000 DASH per month. The fact that DASH is officially financed by the blockchain itself - the value of its units supported by a democratic process of investment voting - may mean that DASH is a kind of developing and adaptive living organism. Or, at least, this is a vivid example of a mythical and so far only imaginary Decentralized Autonomous Organization. For example, an increase of the block to two megabytes was agreed in DAO Dash in 24 hours, gaining 99% of the votes "for". Bitcoin has been discussing the same issue for almost three years. And only the activation of SegWit allows you to accept a change in the transaction ledger for the next few months. So it turns out that the Dash blockchain finances its own development. It sounds futuristic, in the best traditions of "Terminator", but it does. It turns out that every month 10% of all received by Dash (currently this amount is 6 160 000 $) is spent on improving the system. Just imagine! Perhaps it's time to write a conclusion. I thought where to place this crypto currency - in reviews or in perspective. I used to think that Dash is just a bitcoin fork, but I kept it for a long time, because I liked their concept of masternode. But now, after a thorough study - I'm sure that Dash - can at one point go into the leaders of the crypto industry. For example, the Lightning network was implemented in Dash even before the first test in litecoin, and the transaction anonymization model was earlier than in xmr. In addition, the use of the concept of 11 hashes makes it possible to achieve fault tolerance in case of breaking of any of the hashes. And most importantly - it's a DAO model, used in Dash, which allows crypto currency to finance itself. It's just an unrealistically cool tool that allows you to make a truly decentralized crypto-currency where every participant can take part in the life of the project. Yes, this crypto-currency has its drawbacks, for example, the masternodes contribute to centralization, and the anonymization model itself can be studied and recovered, and also remember about the pre-goal. This crypto-currency has a good future, because huge money from the blockchain is allocated for its development,. In general, Dash is an excellent, promising coin that corrects a lot of big disadvantages of bitcoin and which should be in the portfolio of everyone who deals with crypto-currencies. Personally, I bought for $ 100 Dash (I regret that not for $ 10). The information above is an author’s personal point of view and we do not encourage you to buy any asset.